International Polka Music Hall of Fame® Lenny Gomulka and Chicago Push! International Polka Music Hall of Fame® Lenny Gomulka at age 5 took an immediate interest in polka music. He especially liked the drums which he self-taught himself in spare time. His formal training began at age 11 when inspired by his mother to take trumpet instruction. Before organizing his own polka band, Lenny spent his years as a sideman. He performed with and/or recorded with every top reigning polka band in Chicago for decades. He attributes his drive, persistence and success to the help of his brother Richie Gomulka, a former bandleader in the 60's and 70's and guided Lenny in his early years. Lenny Gomulka has recorded in excess of 50 albums with over 25 different artists. Not only has he recorded in the polka circle, but in the modern and Spanish fields as well. In addition he is a songwriter, arranger, composer, vocalist, lyricist and disc jockey. His accomplishments began in early years. He was 1st-place Winner on the "Ron Terry Talent Show" formerly aired in Chicago on WGN-TV Channel 9 back in 1963. He was lst Place winner for 3 consecutive years in competition with the entire Catholic Archdiocese - City of Chicago on both trumpet and clarinet. He was awarded by the "Versatones Polka Fan Club of Chicago" for contributing to the popularity of Eddie Blazonczyk's Versatones. He has been voted trumpet player of the year and clarinet and saxophone player of the year by the membership of the United Polka Association International. In addition to all of the above, his band Lenny Gomulka and the Chicago Push have received numerous awards by various polka organizations throughout the United States. Lenny has been voted "Best Male Vocalist" by the United States Polka Association and International Polka Association. In 1986 Lenny Gomulka and the Chicago Push were nominated for the first Polka Grammy® Award in history. Since then they have received several Grammy® nominations. 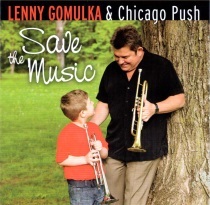 Check out this CD today by Award Winning Lenny Gomulka and Chicago Push!